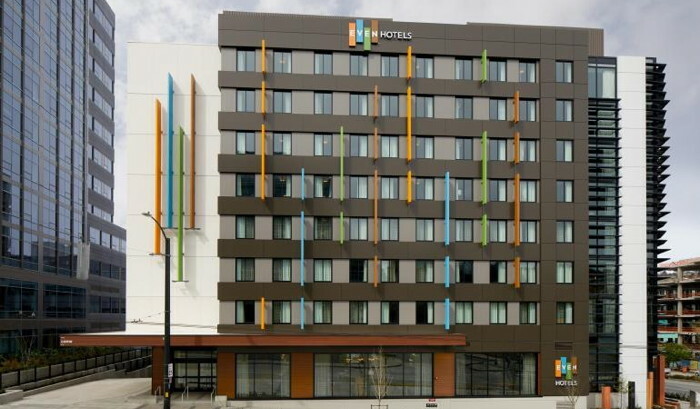 Noble Investment Group and InterContinental Hotels Group today announced the opening of the EVEN Hotel and Staybridge Suites hotel in downtown Seattle. The hotels are adjacent to the Amazon headquarter campus and the new Google campus in the South Lake Union market of Seattle. South Lake Union is also a hub for life science and biotechnology organizations such as the Fred Hutchinson Cancer Research Center, the Allen Institute for Brain Science and the University of Washington School of Medicine. EVEN Hotels is the first hotel created with wellness at its core. The hotel was designed with options guests need to feel productive, nourished, recharged and relaxed. The 123-room EVEN Hotel Seattle – Downtown/South Lake Union, offers a world-class Athletic Studio with best-in-class cardio, stretch and strength training equipment. Guest rooms include a fitness zone with dedicated workout space with in-room equipment and guests can access 18 different in-room workout videos that range from 10 to 30 minutes. For dining, Cork & Kale café offers healthy to indulgent made-to-order options for breakfast and dinner. The hotel will also feature more than 2,000 square feet of meeting space. The Staybridge Suites brand is designed for upscale travelers who are spending an extended time away from home for business, relocation or leisure. The 112-room, urban-style Staybridge Suites Seattle – Downtown/South Lake Union features a mix of studio and one-bedroom suites as well as amenities including complimentary daily hot breakfast buffet and evening reception, guest laundry and a 24-hour business center. Country Inn & Suites by Radisson Opens in Page, AZ.